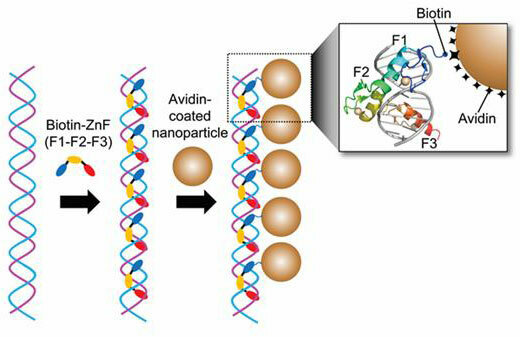 (Nanowerk News) Professor Hak-Sung Kim of the Department of Biological Sciences at Korea Advanced Institute of Science and Technology (KAIST) and Yiseul Ryu, a doctoral candidate, used the Zinc Finger protein that specifically binds to target DNA sequence to develop a new manufacturing technique for size-controllable magnetic Nanoparticle Clusters (NPCs). Their research results were published in Angewandte Chemie International Edition ("Size-Controlled Construction of Magnetic Nanoparticle Clusters Using DNA-Binding Zinc Finger Protein"). A Mimetic Diagram of NPCs Manufacturing Technique Using DNA Binding Protein Zinc Finger. Professor Kim’s team used Zinc Finger, a DNA binding protein, to develop a NPCs manufacturing technique to create clusters of the desired size easily. The Zinc Finger protein contains a zinc ion and specifically recognizes DNA sequence upon binding, which allows the exquisite control of the size and the cluster composition. The technique is also bio-friendly. Transmission Electron Microscopy Images showing different sizes of NPCs depending on the length of the DNA. Professor Kim’s team created linear structure of different sizes of NPCs using Zinc Finger proteins and three DNA sequences of different lengths. The NPCs they produced confirmed their ability to control the size and structure of the cluster by using different DNA lengths. The research used the specific binding property of protein and DNA to develop a new method to create an inorganic nanoparticle’s supramolecular assembly. The technique can be used and applied extensively in other nanoparticles for future research in diagnosis, imaging, and drug and gene delivery.